Make the most of your layover time at Pudong International Airport and go for a tour instead of waiting around in the terminals. 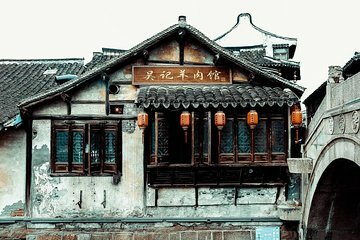 A local guide drives you and your party to Xinchang Ancient Town to enjoy lunch and take a scenic boat ride along the river. Afterward, enjoy a cup of tea as you sit back and appreciate the old way of life that is still prevalent here. I had a great time, my guide was awesome. She messaged me a day ahead of time with information on how to navigate the airport which was so useful. She also assisted me with written instructions in the local language which enabled me to identify what I needed to do in the airport. The food was such an array of things and my family loved the experience. We were able to walk along the water to the many stores and experience the full culture. I enjoyed the water ride. They had great energy and made this layover a pleasant experience rather than waiting all day in the airport.